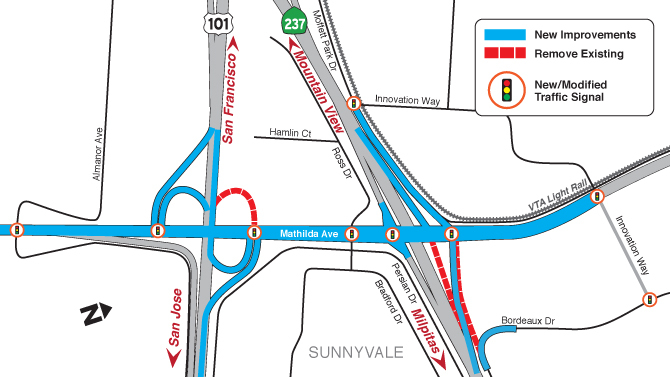 The much-anticipated improvements for the US-101/Mathilda Avenue and SR-237/Mathilda Avenue interchanges are officially starting. A contract was recently awarded to Ghilotti Construction Company. Construction activities will begin in mid-February through mid-2020. VTA, City of Sunnyvale, and Caltrans are partnering on this project supported in part by 2016 Measure B funds. This $42 million investment is made possible through a combination of funds from the City of Sunnyvale, 2016 Measure B, and SB1 Local Partnership Program. To sign up for construction notifications and project updates visit the Mathilda Avenue Improvements Project webpage.